Clients are customers of your organization to whom you bill time or costs for projects. Clients can be external customers or departments within your organization. You should define your clients before setting up projects to eliminate the need to go back and assign the projects to the appropriate client. A System Administrator can set up Clients using Clients Link at the top-left of the application. Click on the Clients link at the top-left of the application. Click + Add Client green button on top-right of the application. 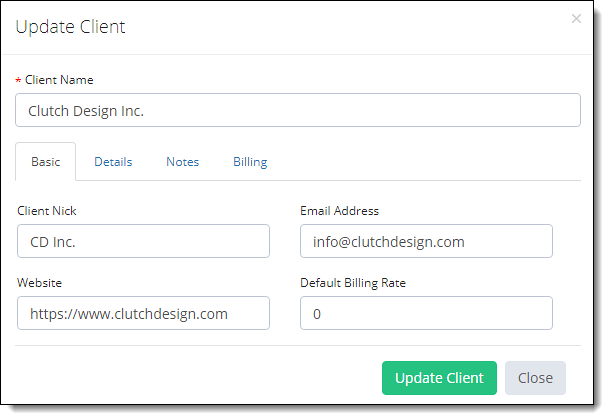 Fill the Client Name (which is mandatory) along with other relevant data if you require. Click Add Client button to add this client to the application. In Client List, click on Options gear icon to the which you want to modify. Make the changes as per your requirement and click Update Client. In Client List, click on Options gear icon to the which you want to delete.